Asmech’s extensive knowledge and experience in materials handling equipment and conveyors offers the ultimate solution for all of your requirements. With years of conveyor experience in a wide range of industries including Dairy, Confectionery, Food & Drink, Pharmaceutical, Blow Moulding, Plastics. Glass and Automotive sectors; we are able to design, manufacture, supply and install with excellent professional efficiency. 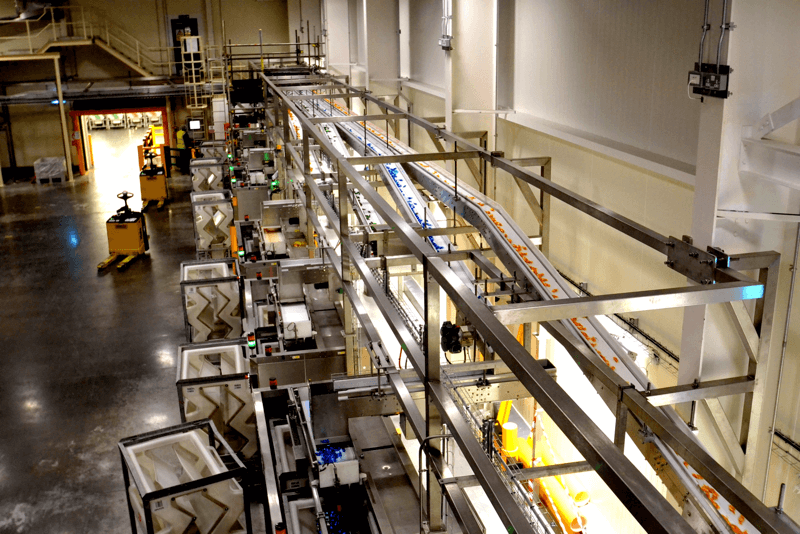 From the design and manufacture of single conveyors through to complete turnkey materials handling systems including full project management; we have the expertise to provide tailor-made solutions from concept through to commissioning. We offer a fully comprehensive range of conveyors, including Slat Conveyor, Modular Belt Conveyor, Powered Conveyor, Belt Conveyor, Roller Conveyor and Bespoke Conveyors to suit your requirements, as well as accessories and components. From a simple one-off conveyor module to a fully automated handling system with controls, we can offer the solution you required and we offer our customers full technical support on product selection Please see below for further information on our product range. Learn more about the history of conveyor belts here. At Asmech, we manufacture and supply a wide range of conveyors for a host of purposes. We are one of the UK’s leading conveyor suppliers and have supplied conveyors to companies from a vast range of industries, including Dairy, Blow Moulding, Plastics, Automotive, Glass, Pharmaceutical, Confectionery and Food and Drink. We can design conveyors to meet a variety of needs and can supply single conveyors as well as comprehensive turnkey systems and fully automated handling systems with controls, overseeing your project from start-to-finish and providing bespoke solutions to meet your specific requirements. Furthermore, we are also able to provide conveyor accessories and components. Conveyors systems are designed to move materials from one area to another safely and effectively. There are many different types of conveyor available to you, with different conveyors serving different purposes. The industry that you operate in is likely to determine the type of conveyor that is right for you. Some examples of popular conveyor systems include the belt conveyor, slat conveyor, heavy duty pallet conveyor, chain conveyor, spiral conveyor and food handling conveyor. There are many other products that you might be interested in, such as a modular conveyor, rotary tables, incline conveyor, flexible conveyor, portable conveyors, and an overhead conveyor. The foundations for modern conveyor systems were first laid down in 1892 when Thomas Robins started work on a number of inventions for carrying products like coal. The first steel conveyor belts were introduced by Sandvik in 1901, and an innovative Turnover Conveyor Belt System was invented and patented in 1957 by the B.F. Goodrich Company. Conveyors can be made from many different materials, and belts often have three layers. Steel conveyor belts are often chosen when a high strength class is needed. Cotton, nylon and polyester being commonly selected for low strength classes. Many belts are made from PVC and rubber materials. Please click here to find out more about the materials used to manufacture our systems. At Asmech, we have been creating bespoke conveyor and handling systems since 1995. We are able to design, manufacture, install and service all the products and solutions in our range. We have been able to work with some of the world’s best-known corporations amongst our client network. Our exceptional knowledge and experience in equipment for handling materials allow us to provide the perfect solution for all your needs. We are passionate about bringing the ideal solutions to life and also offer an outstanding aftercare service to protect your investment. To speak to us today, send a message to sales@asmechsystems.co.uk or call 01623 424 442. Alternatively, get in touch through the contact form on the site. You can also follow us on LinkedIn and YouTube. Why not find out more today?